We’re on the final bag, and forget everything you’ve seen so far: this is probably the most interesting selection of parts in the set in terms of colour. 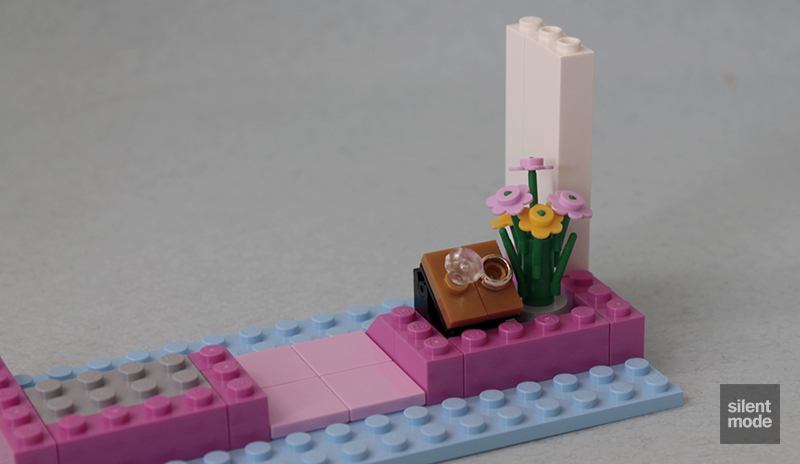 Dark Pink makes a rare appearance for this final build, but sadly we only get one 1×6 tile to go with the six 1×2 bricks, which is a huge shame. Two large and decorative arches in White – which we recognise from the Winter Toy Shop – make an appearance here, which is great if you’re missing them to make something grand. 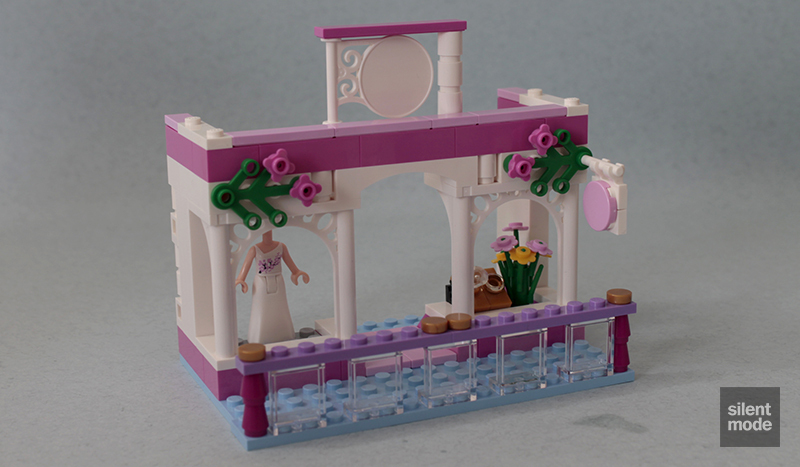 Probably the most exciting parts in the set are the long minidoll skirt in White (on the right), and three Gold rings made famous by the Lord of the Rings theme, but has since been seen in this year’s Parisian Restaurant modular building. 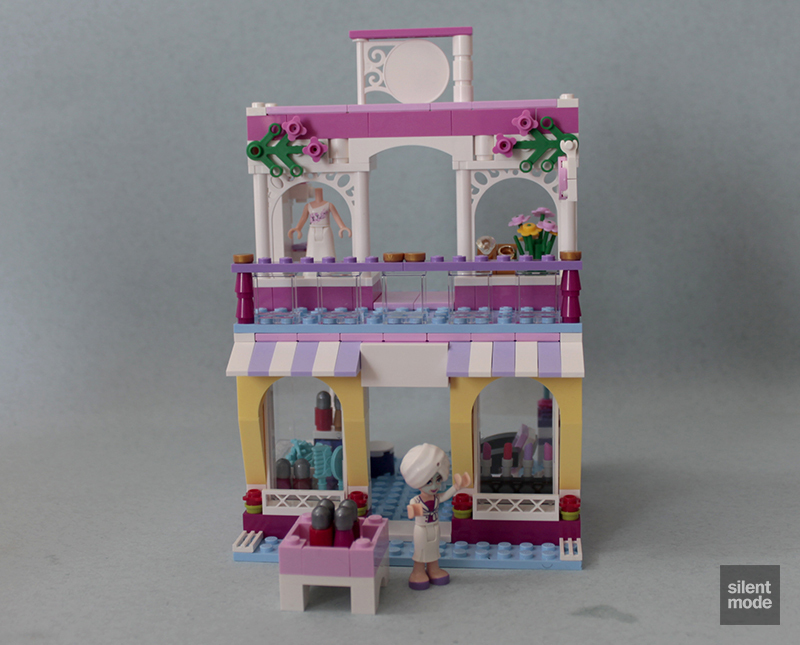 This particular store has a divorce lawyer’s office round the back – but we don’t get to see that in this set, instead concentrating on the front. Dark Pink lines the base. A neat little display using two 1×2 Pearl Gold jumper plates mounted on a hinge is created, giving us somewhere to place a big expensive diamond and one of the Gold rings. We also have what resembles a wedding bouquet sat on top of a Medium Stone Grey “droid head”. Allowing for some adjusting of the jewellery display, we fit the White arches to form the shop windows, along with other White elements. In the other window we assemble another minidoll mannequin, this time wearing a minidoll wedding dress. The torso is shared with three minidolls, one of which is a polybag version of Emma. I have my opinions about weddings, but this is easily the most elegant shop in the entire mall once it’s complete. Convenient (almost) for a shotgun ceremony, it sits on top of the beauty salon. Two – count’em – two Gold rings, and a few also-rans, are left from this bag. And that concludes the building portion of the review!